There are only three things in the world that I hate, and one of them is bad title sequences (for great TV shows). Two years ago I wrote about my top 5 opening title sequences, a list which remains unchanged since then. The American Horror Story titles change each season but remain the scariest thing about the show. I love Firefly as much as the next geek, but why does such a refreshing show need such a dreary title sequence? Joss Whedon wrote the theme song, so it's almost a relief to learn that there's something that man can't do. I love Breaking Bad, who doesn't? Seriously, is there anyone who doesn't? It is a rubbish name though, with a tacky opening sequence that belies the show's high production values. But at least it's short. 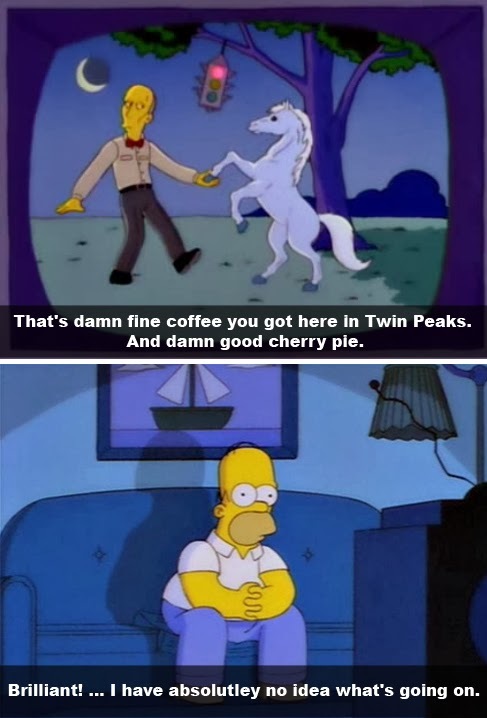 I love Twin Peaks and today's news that David Lynch might be making more although probably not is as exciting and confusing as the show itself. But I always skip the title sequence, because one and a half minutes of nice scenery and boring music just doesn't entice in the way the show does. It's presumably that long because of the huge cast who need credits, but Lost has a brilliantly brief opening despite the size of the ensemble. Instead, their names appear across the bottom of the screen right up until the end of each episode. Thanks for reading, here's Jurassic 5.